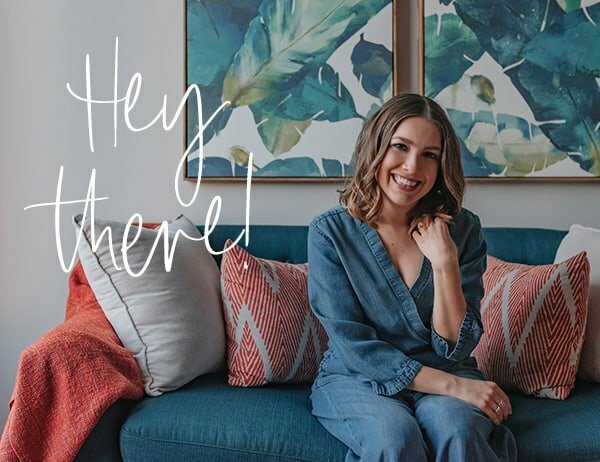 It’s the most frequently asked question I get on the blog so I figured it’s about time I answered it in depth! 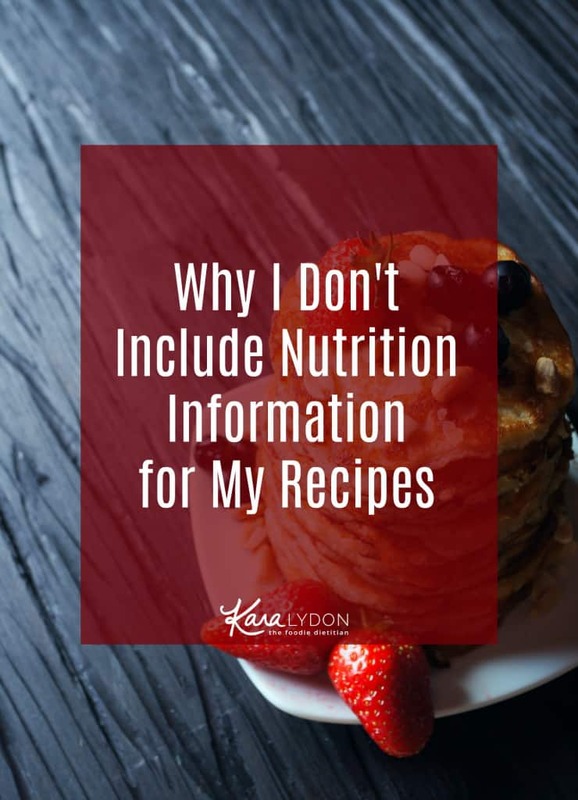 Explaining why I don’t include the nutrition information for the recipes on my blog. When you visit my blog, you will never feel an ounce of food guilt or shame due to some numbers. If you’ve asked me this question before or thought about asking me it, this post is not meant to call you out or offend you, it’s meant to shine a light on the WHY behind this decision. It’s really hard to include everything I want to say on this topic when I’m responding to a comment on the blog so I hope that this will help better explain my stance. 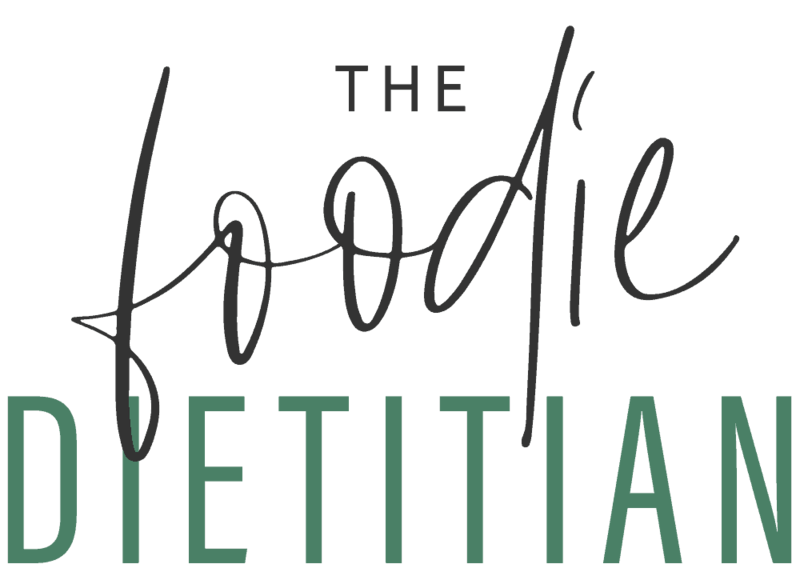 I don’t include the nutrition information on my recipes because it goes against everything that I practice and believe as an intuitive eating dietitian. 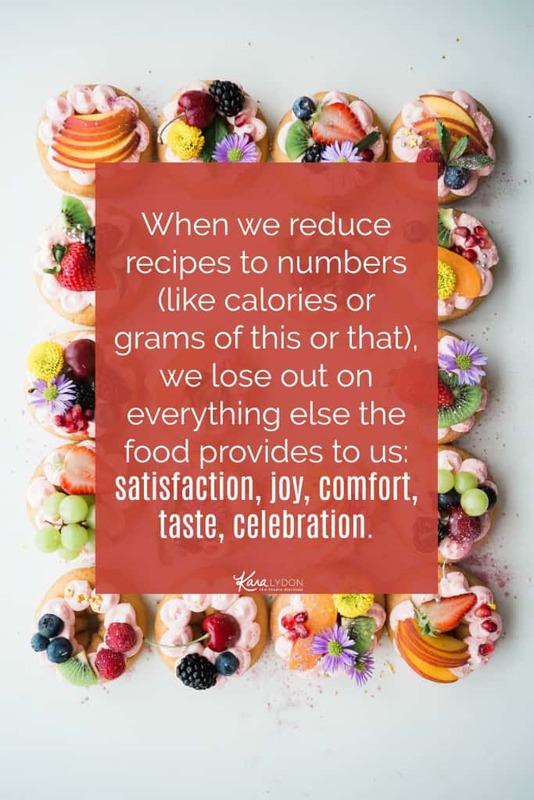 When we reduce recipes to numbers (like calories or grams of this or that), we lose out on everything else the food provides to us: satisfaction, joy, comfort, taste, celebration. It’s really hard to truly enjoy the food you are eating when you’re worrying about it fitting your allotted calories or macros for the day. 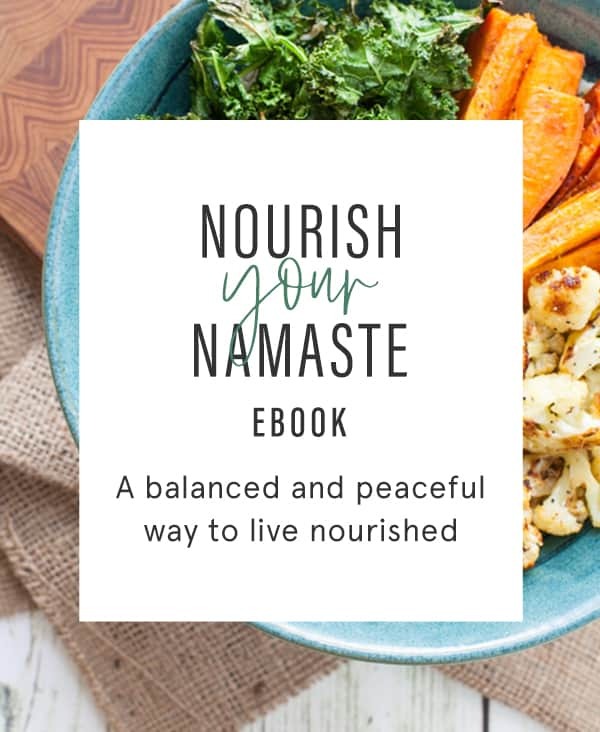 I want this blog to be a safe space where you can celebrate and enjoy food, without feeling guilty, and I wouldn’t be able to achieve that if I included the nutritionals for my recipes. Even before I became a certified intuitive eating counselor, I never included nutritionals on this blog. I never talked about calories or numbers with my clients because I knew that focusing on one number would take away from seeing the larger nutrition picture. For instance, if you only looked at calories, you might dismiss certain foods that are more calorie-dense but provide important satiating nutrients like protein and healthy fat and fiber. Also, counting calories simply doesn’t work for weight loss. When I talk about nutrition and health with clients, I’m always trying to use a wider lens. Over the course of a week, are you getting a variety of food groups and nutrients? Are you focusing on mental and emotional health in addition to physical health? Now I totally understand that some people may need nutrition information for specific medical conditions. If you need that information, there are plenty of recipe blogs out there catered to specific medical conditions; this blog is not one of them. There’s the saying you can’t be everything to everyone and I think that’s applicable here on the blog. I have to stay true to my purpose and my mission and help those who are interested in healing their relationships with food and their bodies. Now perhaps you are trying to heal your relationship with food or you’re trying to recover from your eating disorder or diet culture and the thought of not having access to the numbers freaks you out a bit. I totally get it. The unknown is scary. 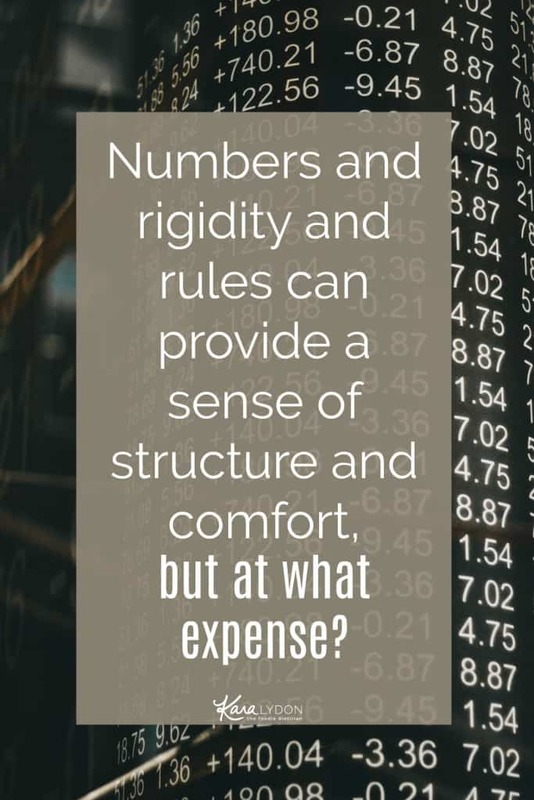 Numbers and rigidity and rules can provide a sense of structure and comfort, but at what expense? What are you losing out on as a result? How is your ED or diet culture acting as a life thief (love this term from Christy Harrison of Food Psych)? 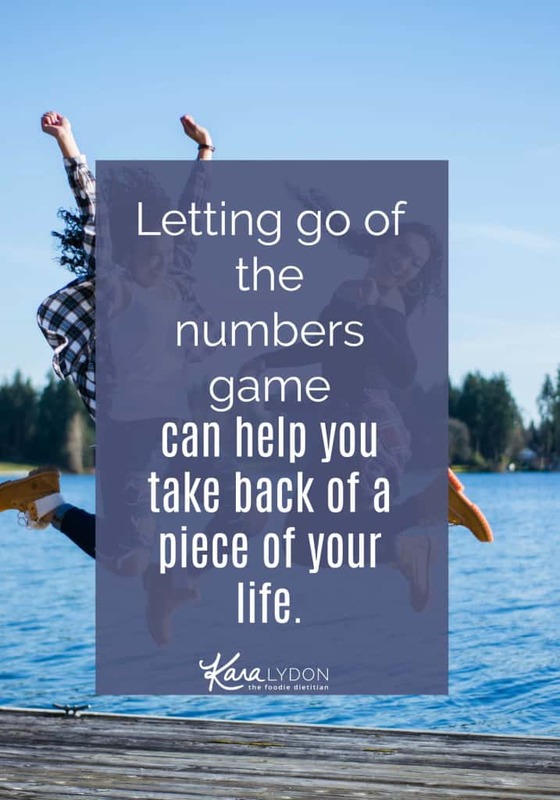 Are you willing to let go of the numbers to take back a piece of your life? Again this post is not to judge or criticize or call out anyone who desires or asks for the nutrition information for my recipes, it’s simply to shine a light on my decision and motive to not include nutritionals. How does having the nutrition information for recipes serve or hurt you? Maybe it’s both. I’d love to hear from you in the comments below. This is great! I don’t include the nutritional value of my recipes and in the past, I have felt like I should even though I didn’t like the idea of turning my food into numbers. This makes me feel much more comfortable with how I have my recipes on my blog so thank you! I’ve been there too, Rebecca. Feeling like I should because there was a demand for it but it’s so important to stay true to your values and morals! Glad you decided to stay true to your beliefs! Oh my gosh, me tooooo! re: jet lag. Great article! As a dietitian myself I really like this perspective you have. It can be too easy to get caught up in numbers. Thanks for sharing Kara! I love this Kara! Do you mind if I direct people here who ask me the same question? It is hard to explain in a reply to a comment. Of course! Please feel free to, Kaleigh! I love this! It’s so true that food should be more than numbers. Thanks for sharing!